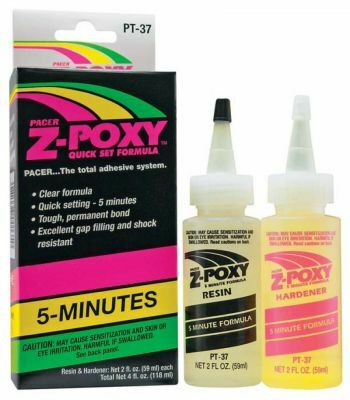 Cures completely clear Z-Poxy is specially formulated to bond to fiberglass, wood, metals, and plastics. Produces a tough permanent bond in just 30 minutes. The total working time of this glue is 3 minutes, and fully cures in 5 minutes. This product contains Epoxy resin and Polyamide resin, some people are allergic to these compounds. Color of glue that arrives may be different than pictured.